Over the last few years, Melissa Freeman and Edwin Cooper have written stories about our Robertson County veterans for our local newspapers. The Robertson County Group of Newspapers has graciously allowed us to compile these stories so they may be collectively preserved and enjoyed. These are the stories of extraordinary men and women who served willingly during no ordinary time in our history. Theirs are stories of lives well lived and sacrifices dutifully made to preserve our country and the liberties it provides. We are fortunate they came home and served their community as well. The Reluctant Warrior tells the incredible and inspiring story of a German boy growing up during the ravages of Hitler and Nazi Germany. He uses his intelligence, humor, stubbornness and ingenuity to survive not only the battles of war, but also life in American POW Camps. The reader lives each moment with him through sorrows, challenges and accomplishments. This book will have you cheering as he not only survives, but later returns to the United States and dedicates his life to finding families for the orphans of the world. 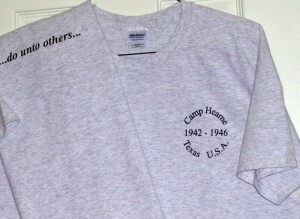 Heavy weight, light grey, 100% cotton t-shirt with Camp Hearne Logo over left breast on front and “…do unto others…” mantra between shoulders on back. This 10oz. ceramic coffee mug is designed to bring back the 1940s Diner experience. The Camp Hearne logo is imprinted on both sides with the “…do unto others…” mantra opposite the handle. This nickel plated lapel pin displays the Camp Hearne Logo engraved in black lettering. The actual size is the same diameter of a dime. This brass military style whistle is the ideal memento for your visit to Camp Hearne. Add it to your keychain for the perfect security item or wear it on the lanyard while walking or jogging in the park.